The orthodontists at Honig Orthodontics and our team thought it would be interesting to share with you the history behind Halloween. Did you know that Halloween is one of the world’s oldest holidays? Throughout the years it has gone through many changes. It was originally a Celtic festival called Samhain (pronounced sow-in). It marked the end of harvest and the beginning of the new year (November 1st). Centuries ago, the druids believed that ghosts and spirits roamed the earth at this time, and they lit bonfires as protection against the evil spirits. When the Romans captured the Celtic lands, they adapted the day to honor their own deities. Pomona, the goddess of fruit and trees and was represented by an apple in their rituals. It is thought this is why we bob for apples at Halloween parties today! Over time, the Roman Catholic Church adapted the day as All Saints’ Day, or All Hallows’, Day, to honor saints who did not have a specific feast day of their own. The name gradually transformed into Halloween. The tradition of trick-or-treating dates to All Souls’ Day parades in England. Villagers gave poor people “soul cakes” in return for prayers for their dead relatives. In the 1920s, American kids began the tradition of trick-or-treating in their neighborhoods for candy and treats. 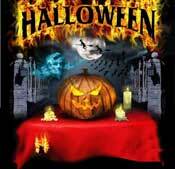 It no longer held its religious meaning and became a holiday where people began wearing costumes for one night. It developed into a fun night and inexpensive way for communities to celebrate together. Other countries have their own celebrations, but with different meanings. In Mexico people celebrate El Dia de los Muertos, or Day of the Dead. This is a time to honor and celebrate the dead. Families clean and decorate their relatives’ graves, and on the night of November 1, everyone meets at the graveyard. Traditionally, this is the time that spirits are believed to return to the land of the living. When wearing braces, we ask patients to be careful when eating candy they collected on Halloween. We suggest you only eat the soft candy that won’t damage brackets and wires to eliminate problems. Also brush your teeth well after eating, to prevent cavities. At Honig Orthodontics, we want our patients to enjoy the holiday traditions. Please keep in mind our recommendations and have lots of fun! Watch this video on YouTube which discusses the best candy to eat while wearing braces sponsored by the AAO.